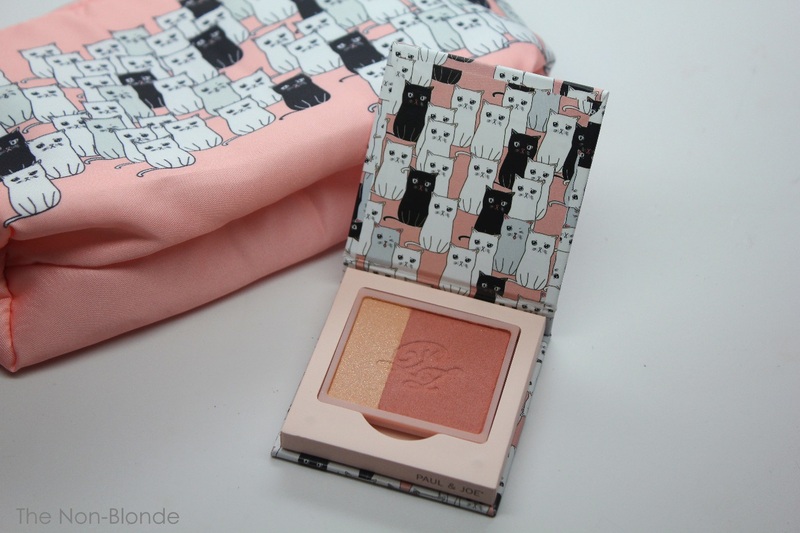 It looks like while I was taking my time testing these Paul& Joe Fall 2015 items, the limited edition packaging with the cats has sold out in the US. Yes. Fall collection that gets sold out in August. An online search shows that it's still easy to find in the UK, but us Americans seem to get more and more cat-crazy. And who can blame us? These Paul & Joe cats are adorable. The blush color I picked for the refillable case is Cinnamon Roast 001, and it's part of the aforementioned fall collection. It's a satin finish neutral spice-colored blush with a golden peachy high shimmer highlighter. I like to swirl them together for a nice healthy glow that's perfect for this traditional time of the year. 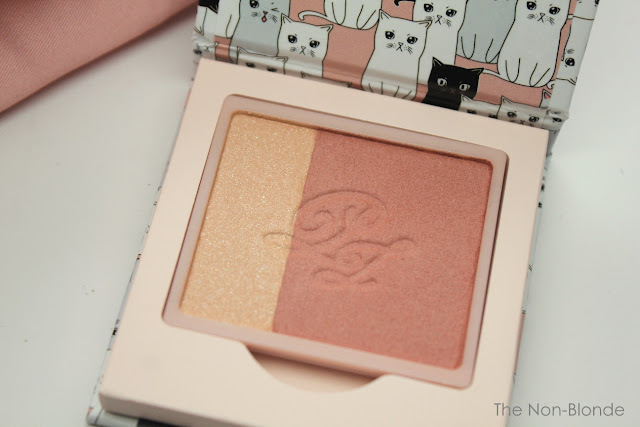 I also wear the blush part by itself as an effortless yet trendy color. The highlighter is the weakest link here, though. It's a bit too yellow and intense to stand on its own. Maybe as an eye shadow, but I haven't tried it this way. The lipstick refill you see here is actually not part of the fall collection. Only the cat case is. 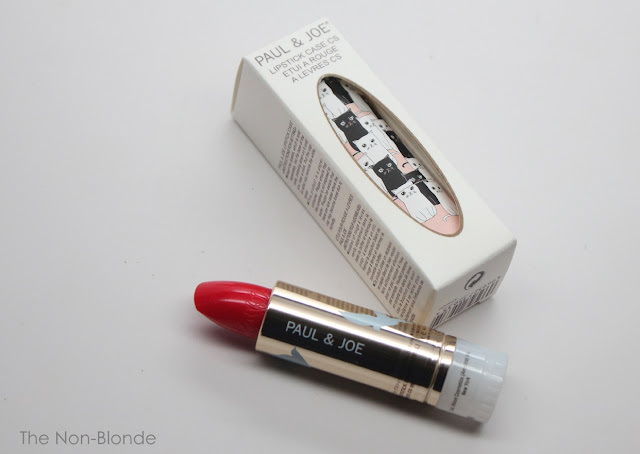 I seem to do that with most Paul & Joe limited items- get the case but go for another lip color. 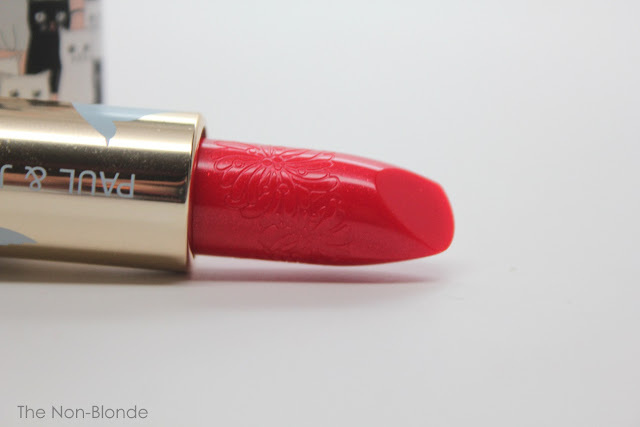 The color I chose, Rosebud 086, was another limited edition, I think from the spring lineup. It looks intense in the bullet, but it's actually very sheer and gel-like. 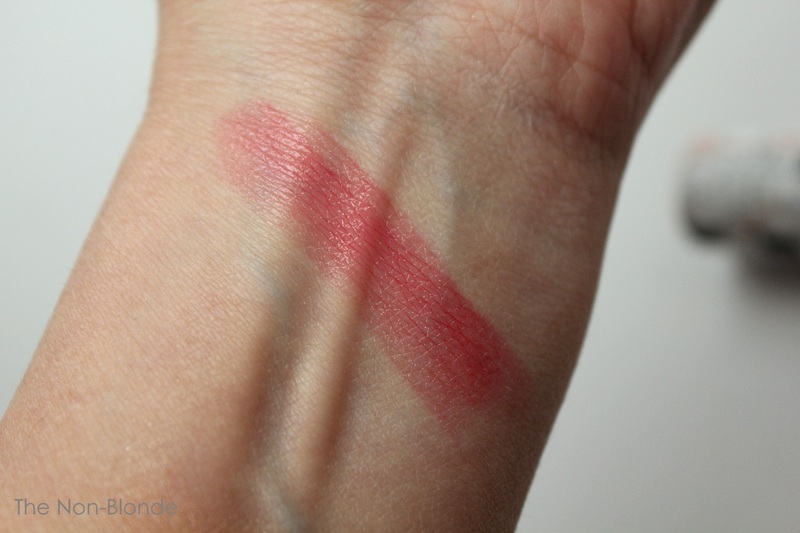 The color gives the lips just a little boost of a pink-based red. It's easy to wear, goes with almost everything, and the formula is moisturizing and comfortable. It's not long lasting and fades within a couple of hours, but the whole point here is getting the case out and reapplying, while the adorable cats wink at you. The makeup bag was a GWP back when I bought the makeup from Beauty Habit. It's since sold out, but I can tell you that if you've missed the opportunity it's not a big deal. while the bag is beyond adorable and of a great size, the fabric is dirt, gunk, and debris magnet. I managed to stain it with lipstick while I was taking the photos and it took me a couple of hours of effort to remove the mark (using cleansing wipes that I let sit on the spot). every speckle of dust, makeup, and general dirt attaches itself to this material, and even the most pristine handbag will cause the bag to look grubby in a day or two. I decided to keep it in one of my dresser drawers to hold perfume decants. It's safer this way. Bottom Line: there's no bottom line. 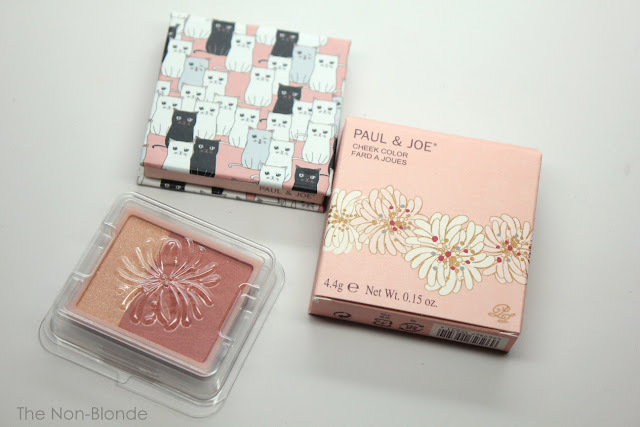 Paul & Joe fans tend to buy their stuff for the packaging, while the actual product quality varies greatly. In the case of Fall 2015 collection the stars were lips and cheeks, which are probably the brand's better formulas, so that's why I was happy to get them (I usually skip their eye shadows and base products). If you know of a place that still has the cat cases in the US please let all of us know. Otherwise, the refills are available from BeautyHabit.com and b-Glowing, and various sources overseas. 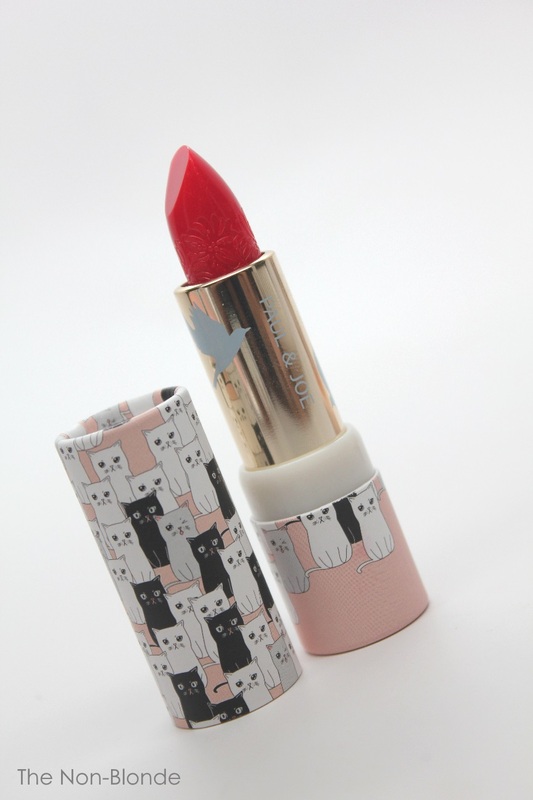 Paul & Joe Cheek Color refill ($18) and case ($10), and Sheer Lipstick ($20) and case ($7) are all made in Japan. For availability see above and do an online search. Leftovers from seasonal collection tend to reappear at various discounters after the fact. So incredibly adorable. The lipstick looks a bit too sheer for my taste but the packaging is convincing me to get it anyways. 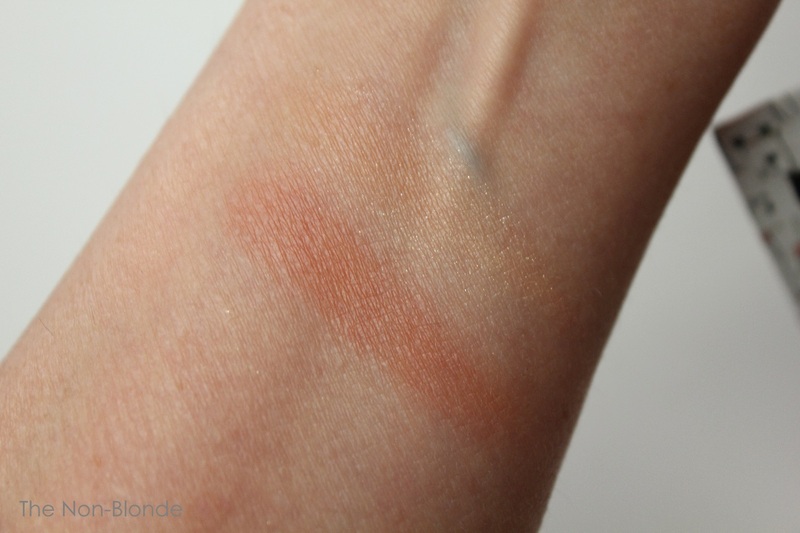 Does the blush "grab" when you put it on or is it pretty silky?